The gilt brass plate has a rule riveted to one side, an alidade with folding sights pivoted at one corner, and two fixed folding sights. The central area has two horary quadrants, an inner one for unequal hours and an outer for equal hours. At the outer arc of the equal-hour quadrant is a degree scale ('QVARTA ALTITVDINIS') 0 to 90, divided to 10, subdivided to 1, numbered by 5. Outside this is a solar declination scale marked with the degrees of the zodiac. Two sides of the square have an elaborate geometrical quadrant scale ('VMBRA RECTA [star] DAT DISTANTIAM [star][star][star]' and '[star][star][star] VMBRA VERSA [star] DAT ALTITVDINEM [star]', with 13 different pairs of scales, having each side divided 0 to 12, 30, 60, 100, 200, 300, 400, 500, 600, 700, 800, 900 and 1000 respectively. The undivided sides are marked 'TOTA SCALA DAT DISTANTIAM [star][star][star]' and '[star][star] TOTA SCALA DAT ALTITVDINEM [star][star][star][star]'. The fixed rule and alidade have matching scales 10 to 200, divided to 5, subdivided to 1, numbered by 5, but on the alidade, which is longer, the scale is continued to 280. Each of these scales is divided by diagonal dots to 1/5. On the reverse the square has a central disc secured by four screws, with a central threaded post for mounting. There is a telescopic mahogany stand and a universal joint, and a steel pointed base for driving into the ground. 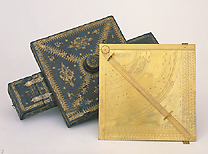 A fitted wooden case is bound in leather with brass hinges and decorative gold tooling.